Joyce Francis Payne, 78, of Louisville, KY, passed away on December 1, 2018. She enjoyed singing with Joyce O'Neil and the Soundwaves and some of the all time greats, George Jones, Patsy Cline and Tammy Wynette. 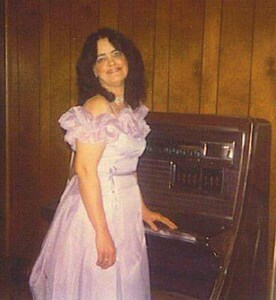 Joyce also recorded three singles in Nashville, TN. In her later years she enjoyed entertaining at local VFW posts and being with her friends. She was preceded in death by her husband, Harold Payne; parents, Reedie and Viola Hicks; brothers, Junior Hicks and Roy Hicks; sisters, Barbara Hall and Doris Craft and great-granddaughter, Harper Sue Gamble. Joyce is survived by her sons, Mike (Sue) Gamble and Tony Abrams; 5 grandchildren; 9 great-grandchildren; brother, Billy (Gloria) Hicks and sisters, Ruth Green, Deborah Walters, Brenda (Juan) Hicks Rivera and Karen (Thomas) Hicks Swift. Visitation will be Sunday, December 9, 2018, at Newcomer Cremations, Funerals & Receptions, Southwest Louisville Chapel, 10304 Dixie Highway, Louisville, KY, from 12pm-6pm. A celebration of Joyce's life will be Monday, December 10, 2018, beginning at 11am at the chapel of the funeral home. To leave a special memory of Joyce for the family, please select the "Share Memories" tab above. Add your memories to the guest book of Joyce Payne. I remember when she sang at skyway lounge and Swiss park she not only graced us with her beautiful voice but she touched our hearts and souls with her words.I remember what a fun and careing and loving person she was and her smile lit up the whole room.You will be missed aunt Joyce love you. I didn't know Joyce very well. ...but I met her at Todd & Helene Nalley's benefit. She was so nice, gracious and friendly. She came all the way to Loretto as well. I've been told she was always the first to help when others needed help. Joyce may you rest in peace. Aunt Joyce thank you for the memories. You were definitely a huge mentor of mine. I know you're dancing in heaven and loving the time with the loved ones we've lost. You will be missed and never forgotten. My sweet friend, I miss you so. Had I known that morning when I spoke with you would be the last time I would have held on much longer! I hope you knew how much you meant to Larry and I and that we loved you dearly!! I will hold close the memories of all of our outings!! What fun we had!! You will be forever in our hearts!! Fly high sweet lady and we will see you again one day!! Love you!! Rest Easy my Beautiful Sister,I have so many memories of you an I,like the time we went shopping downtown an you got me that pretty little sundress an sandals to match ,then we had lunch together,And oh how i loved the pickin an grinin at your house with Daddy, Uncle James you all would sing drink coffee and have such a good time , while Mike an Tony an I would look for some trouble to get into, an we usually found it...lol..Then when i got older an got my License i would come by the Bus Station to see you while you were at work...So many Precious Memories... I love you Sis..I know your singing with the Angels now but that still don't help the pain of losing you so suddenly..You will be forever in my Heart. You are with your Heavenly Father now. Thanks for the many days setting with you in friendship and listing to you talk and sing. What memories will remain with us. Dining with you late at night was our pleasure. Along with Wanda and I and all your friends you will be remembered and missed. We love you. R.I.P. beautiful lady Joyce Payne and wear your wings proudly.